When discussing propulsion, hypersonic flight or atmospheric entry, the question of cooling is always prominent: cooling implies discarding the rejected energy [Ahern, 1983, 1992]. Thermal management implies that a fraction of the rejected energy creates useful work or thrust [Barrére and Vandenkerckhove, 1993]. The concept of thermal management begins typically with two separate engines that are thermally integrated by having the fuel (in this case hydrogen) flowing through both engines before a portion of the collected thermal energy is extracted as useful work. This first example is limited to an airbreathing Mach number of 6 and the airframe is not a part of the thermal integration concept. Figure 4.16 is from [Rudakov and Balepin, 1991] and shows performance of a Japanese LACE rocket with a pressurized liquefier, as part of a scram-LACE system [Aoki and Ogawara, 1988; Aoki, et al., 1991; Yamanaka, 2000, 2004], and of a Russian deeply cooled rocket, integrated with a ramjet [Rudakov and Balepin, 1991]. The solid line identifies the deeply cooled rocket, by Rudakov. The central dashed line identifies a hydrogen ramjet by Rudakov. When simply operated independently, the combined thrust and fuel flow produces about a 500 s 7sp increase, as indicated by the lower dashed line identified as combination of rocket/ramjet. 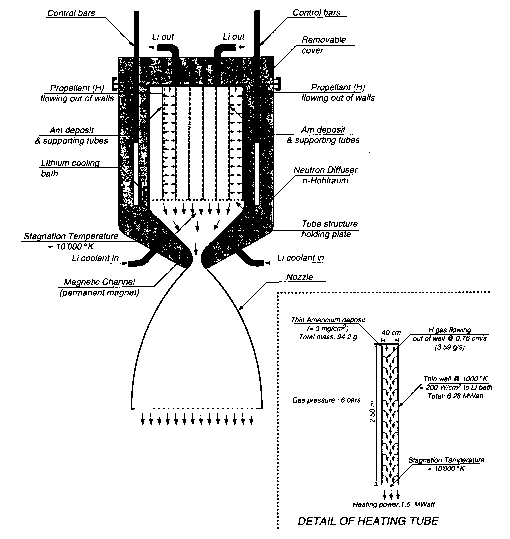 When thermally integrated, the fuel flows through both engines, collecting thermal energy, from both the rocket and the ramjet, that is used to power the expansion turbines that drive the turbocompressor; thus, the same two engines, when thermally integrated, provide a 1,500 s increase in 7sp over the combination of rocket/ramjet, as indicated by the top dashed line. Thus between Mach 2 and 6 it is possible to have the thrust of a rocket and the specific impulse of a military subsonic turbofan, e.g. 4,500 to 4,000 s (specific fuel consumption from 0.8 to 0.9kg/s per kg of thrust). This concept could be preceded by the development of the airbreathing rocket, that does produce a tangible benefit for operational launchers based on existing rocket engines and hardware technology. This initial step could deliver an interim operational capability in terms of a sustained-duration-use rocket launcher, in parallel with the development of the ramjet engine to be incorporated later into this propulsion system, eventually developing into a scramjet version of the ramjet. When these principles are applied to SSTO and TSTO launchers, size and weight are reduced (both dry and gross weight). These three propulsion systems could profoundly affect the size and weight of both SSTO and TSTO launchers if they were applied. Their advantage is that they are fabricated of existing tested and demonstrated hardware and use current industrial capability. Alan Bond and Alexander Rudakov were pioneers in the construction of actual hardware with operational potential. Unfortunately the status quo environment prevailing in aerospace propulsion steadfastly maintained rockets were known solutions, and better than new concepts based on the very rockets they advocated to the exclusion of all else.